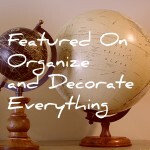 Thing One | Welcome to the Creative Collage - Come In and Stay Awhile! Our school kicked off the reading month with a day to celebrate Dr. Seuss’ birthday. 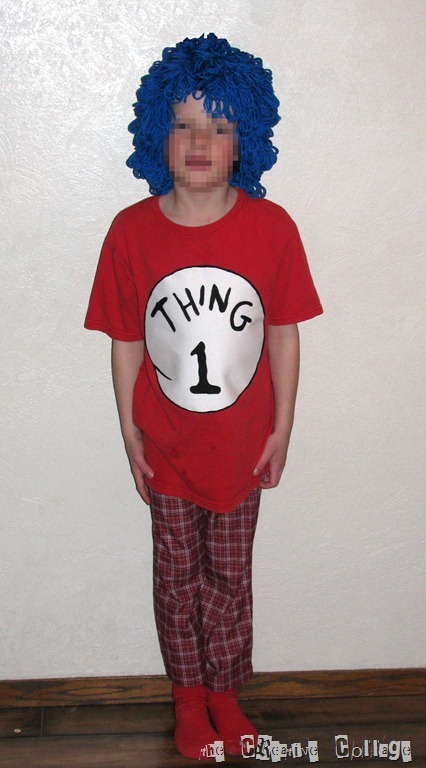 So, a couple days before I started working on something for the kids to dress up as a Dr. Seuss character. I was not going to get anywhere to buy a blue wig for Thing One so I needed to come up with something with things that I had one hand. 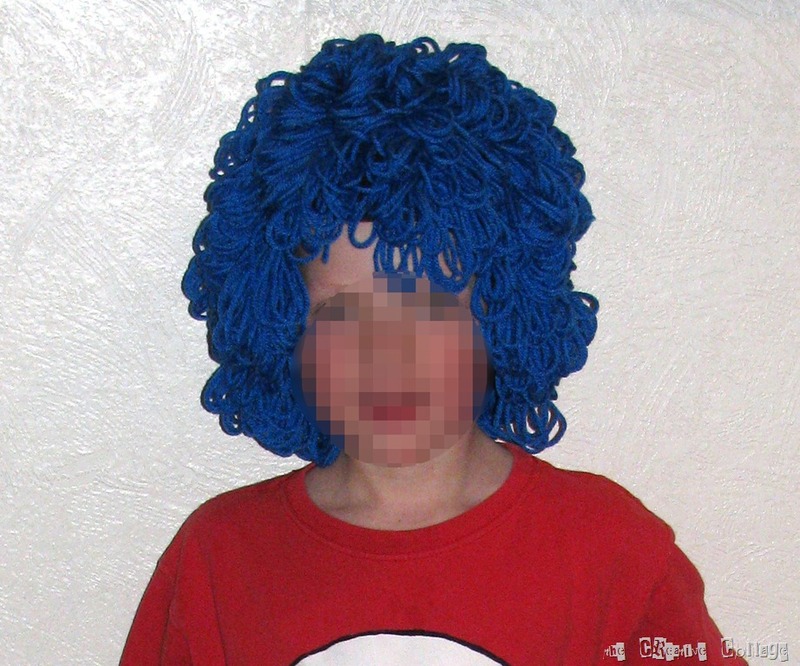 Thus the Stocking-Hat-Turned-Yarn-Wig was born! We keep a lot of inexpensive stocking hats around because my youngest son tends to plant them wherever he goes. 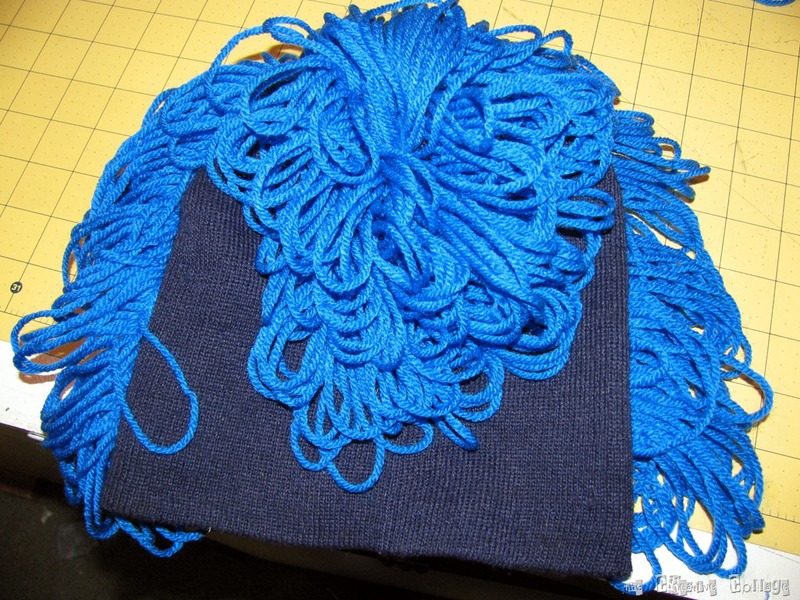 So using one of them as the base, along with some bright blue yarn I had, this is what I came up with. It was rather quick and dirty, but it serves it’s purpose! 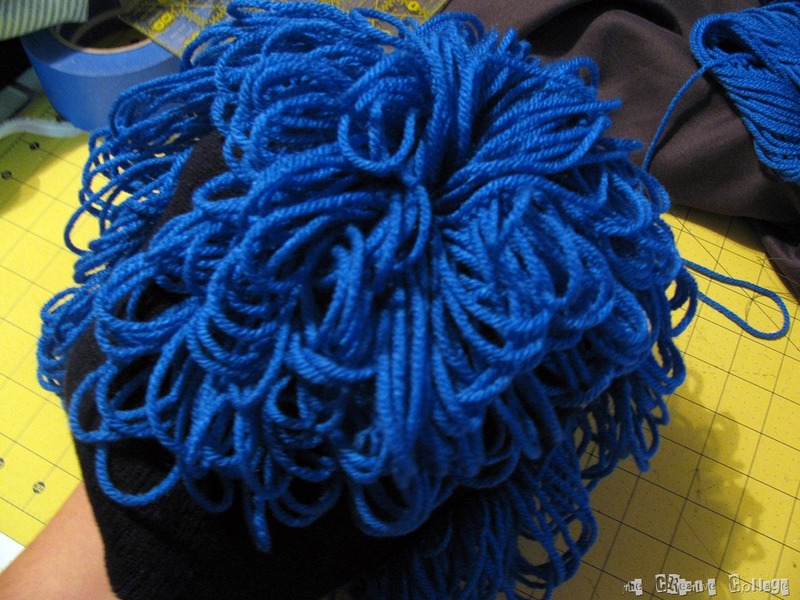 This is what I used to make the wig. I just grabbed some thin foam core but cardboard would work also. 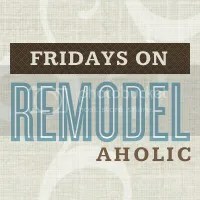 This is not something that lasts a long time – you need to be careful with it but it will get you through this project. This is about 6” by 9” or so. The measurement will determine how big the loops on the wig are. I cut the edge off two of the corners to make it remove. There is also a slit at the top on the left hand side and a cut through the left side. I’ll explain the purposes of these things as I go along. Here you can see that the slit at the top is holding the yarn and as I began wrapping, I made sure to hold the cut edge together. Then you can start wrapping. 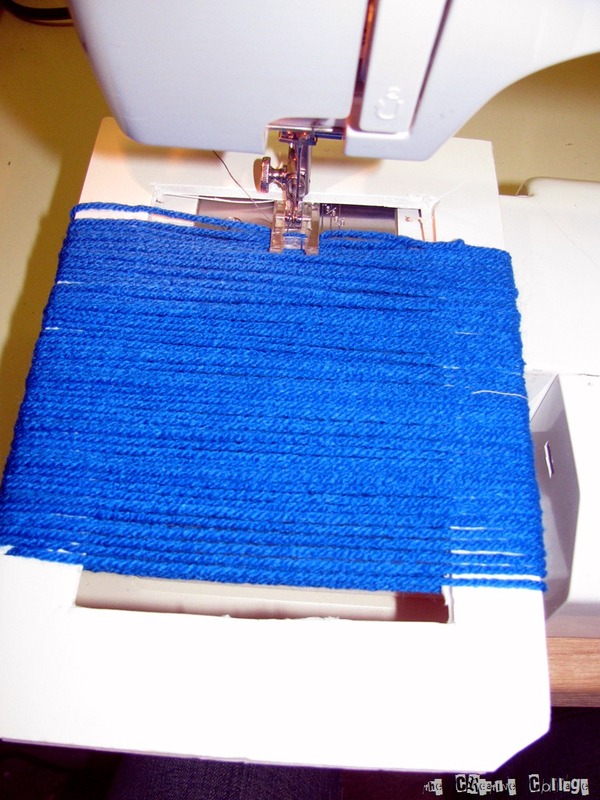 Make sure that you do not stretch the yarn or wrap too tightly. 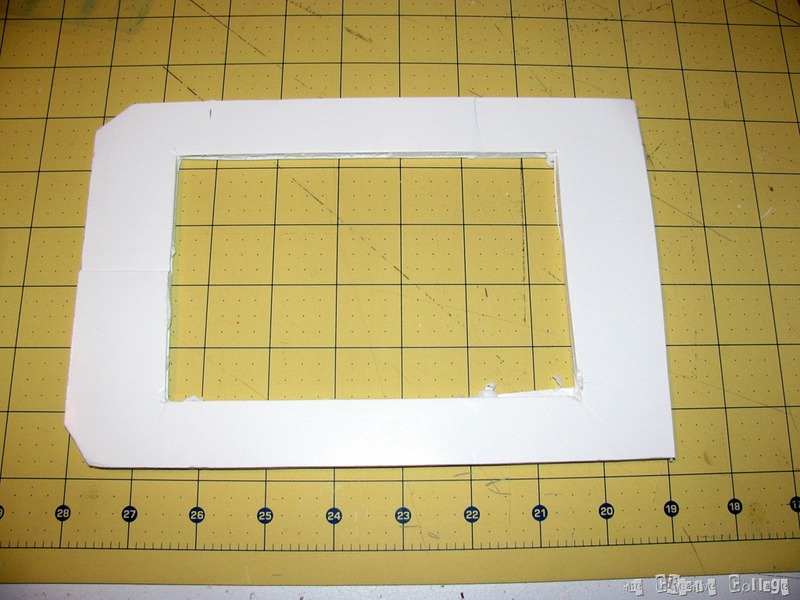 It will make it very difficult to remove later and it will also break the foam core frame (ask me how I know!). I wrapped mine a total of 50 times and then cut the yarn. 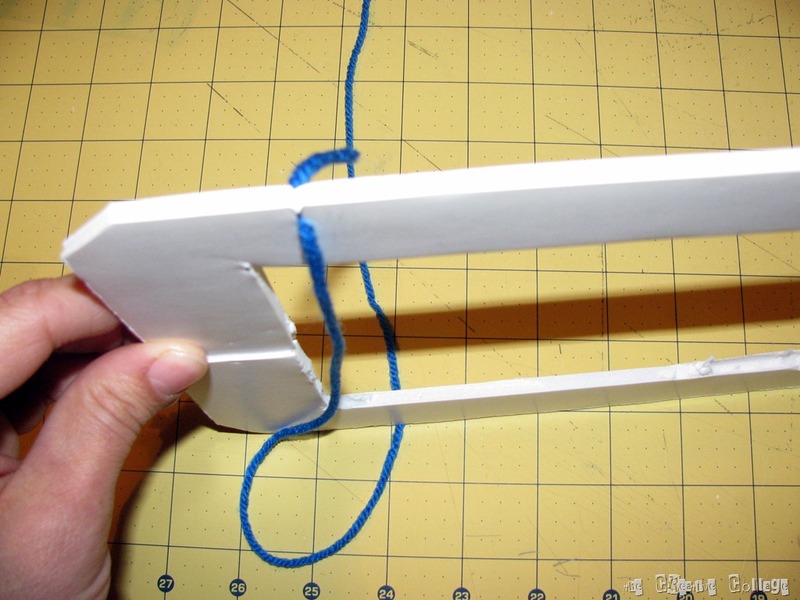 I then too it to the sewing machine, lifting the presser foot over the foam core and started to sew a straight stitch through the center of the yarn loops. 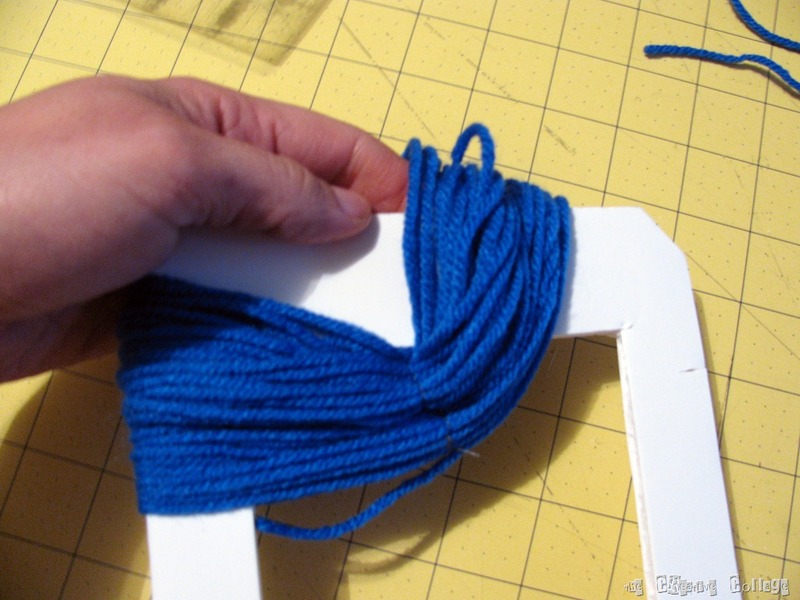 Make sure that you use your fingers to press the yarn through trying to keep it feeding evenly. 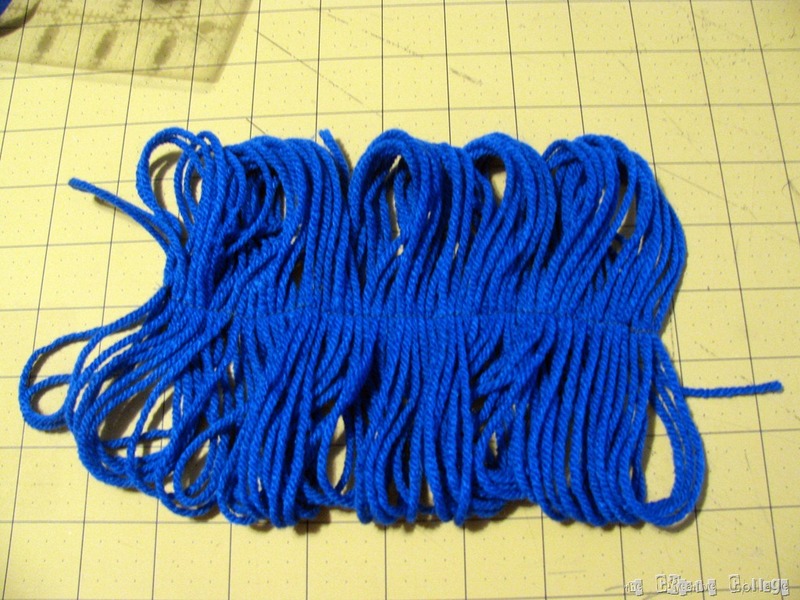 I also backstitched at the beginning and the end to hold it more secure. 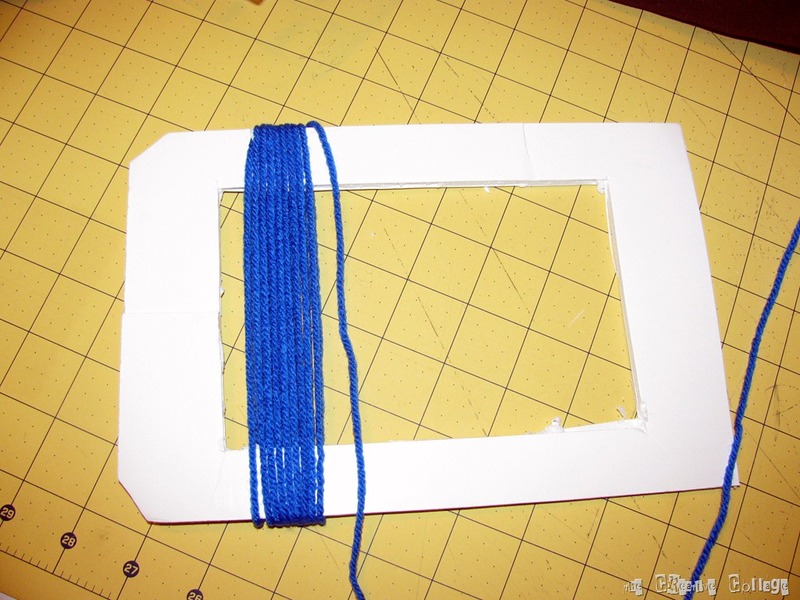 Then remove the frame and yarn from the sewing machine. Above you can see the seam through the center – perfection is not required! 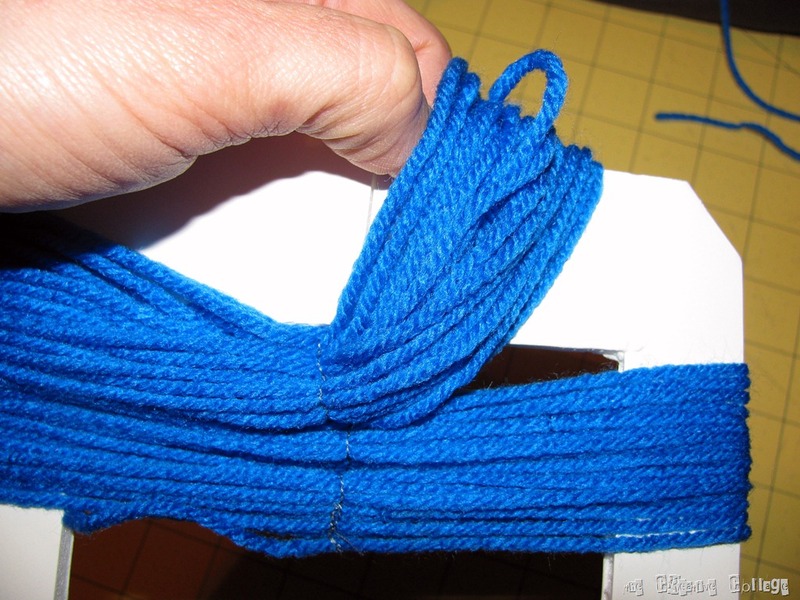 Push the yarn as far toward the side with the cut corners and the cut side as you can and slowly slide off one side – make sure that you release the starting yarn from the slit. 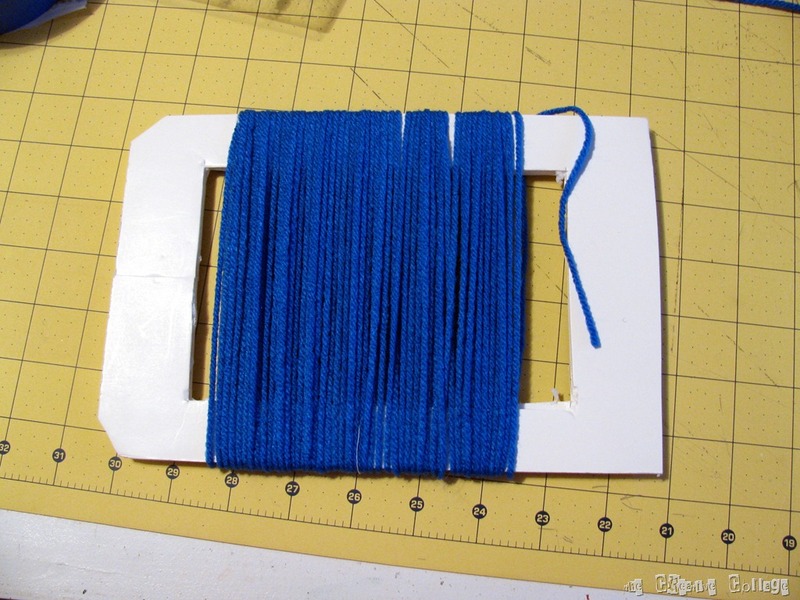 Once you have all the yarn off the one side, part your frame slightly allowing the yarn to slide and release from the frame. Then you are left with just one side on the frame. 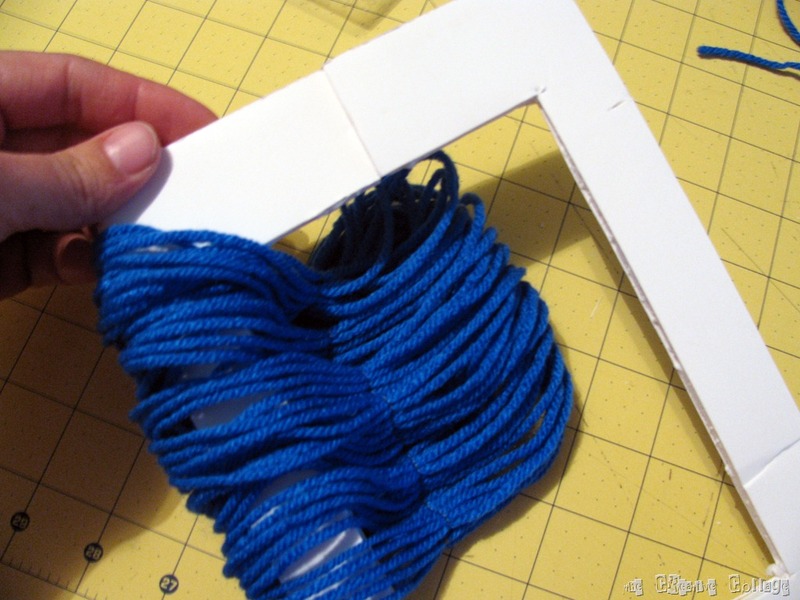 Slide the remaining yarn through the cut side – again, try not to bend your frame too much or it will break! And this is what you will be left with! I think I made around 12 or so for the wig. It could’ve used more, but I was out of yarn so there were a few spots that showed the dark stocking hat through but not too bad. Ideally you would find a matching hat that would not be noticeable. I started sewing each yarn strip on to the hat trying to follow the way that hair would fall and that would hide most of the stocking hat. 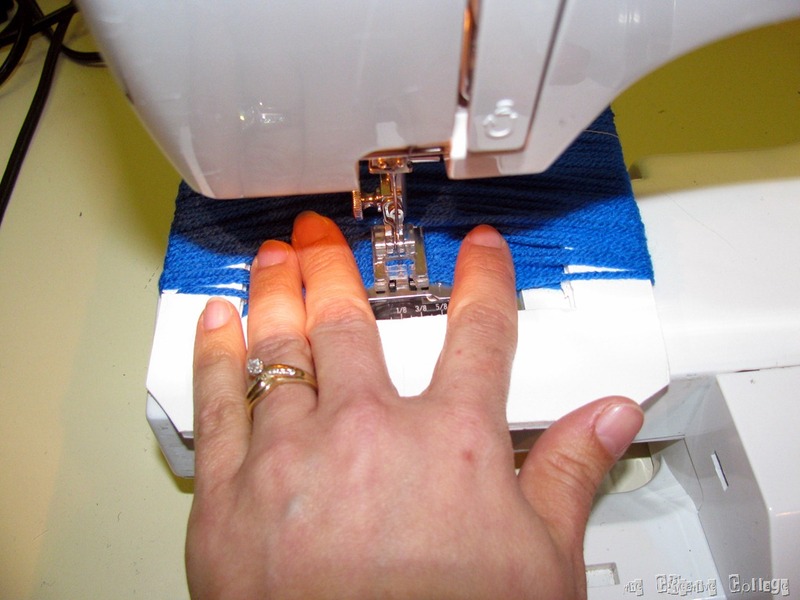 You just need to sew along the same seam that you did to make each yarn strip to attach it to the hat. 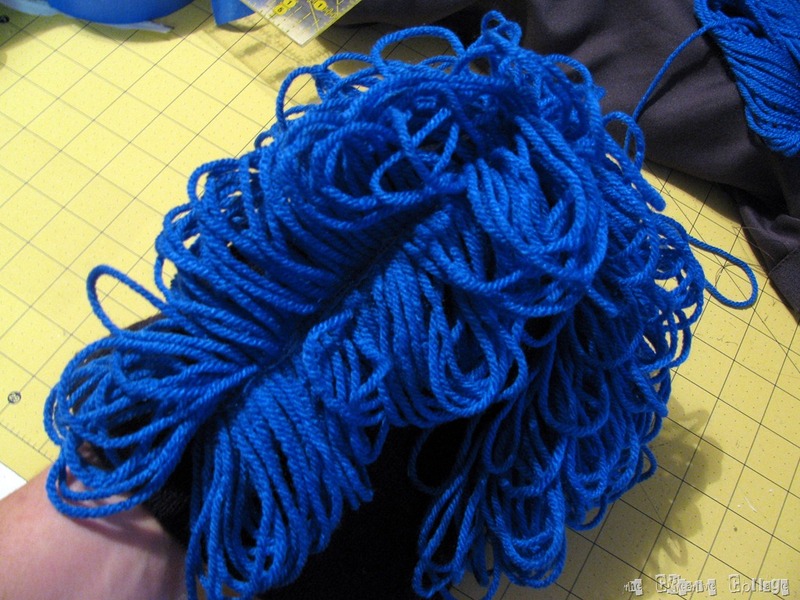 As the hat gets fuller, it is more tricky to keep all the loops from hooking on the sewing machine! 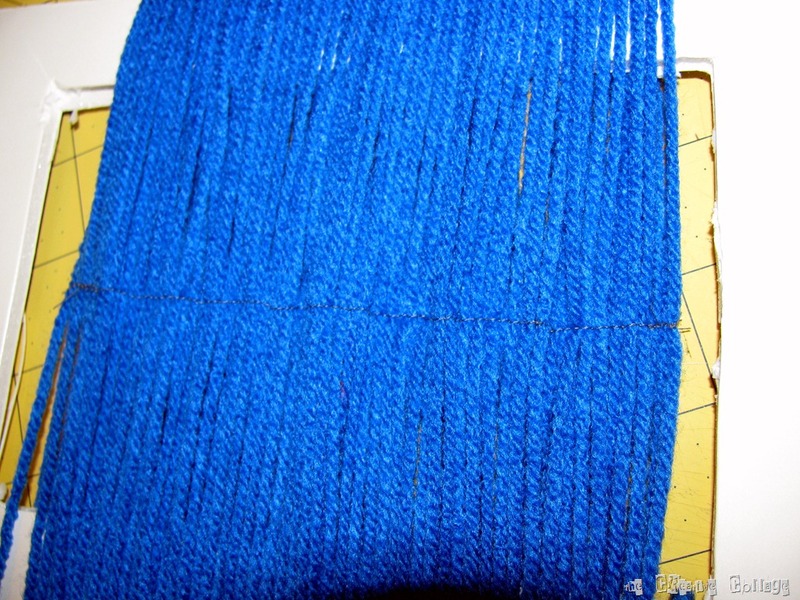 I think I put three strips over the top and then added a couple strips down each side. Then I added 2 strips in the 4 quarters left. If I had extra left at the bottom of the hat, I just curved it toward an empty spot. Like I said, not perfect by any stretch, but it turned out pretty cute! I also added a Thing One emblem on the front of a red t-shirt we had to complete the costume. 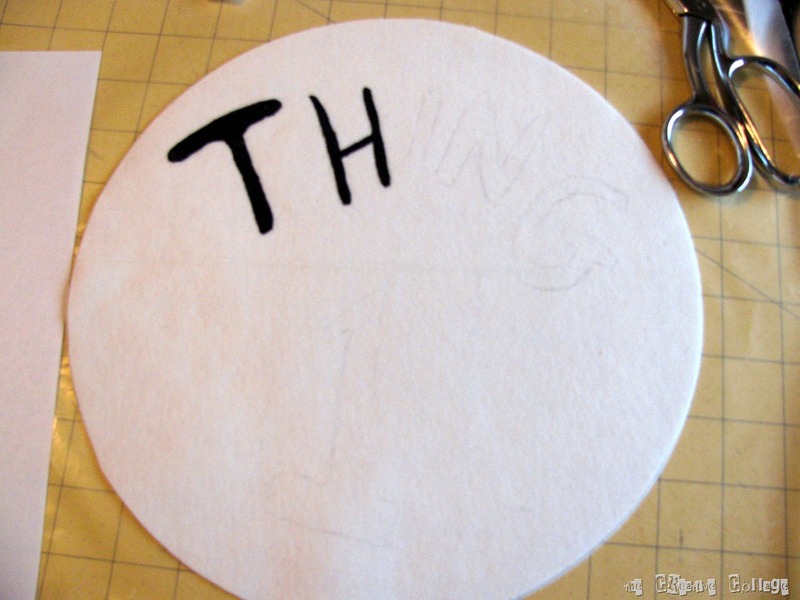 I cut a circle out of white knit (non-raveling) and added interfacing to it. 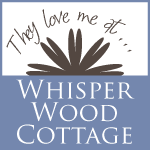 I used a pencil and traced out where I wanted to paint the sign. I freehanded it using a picture I found online. 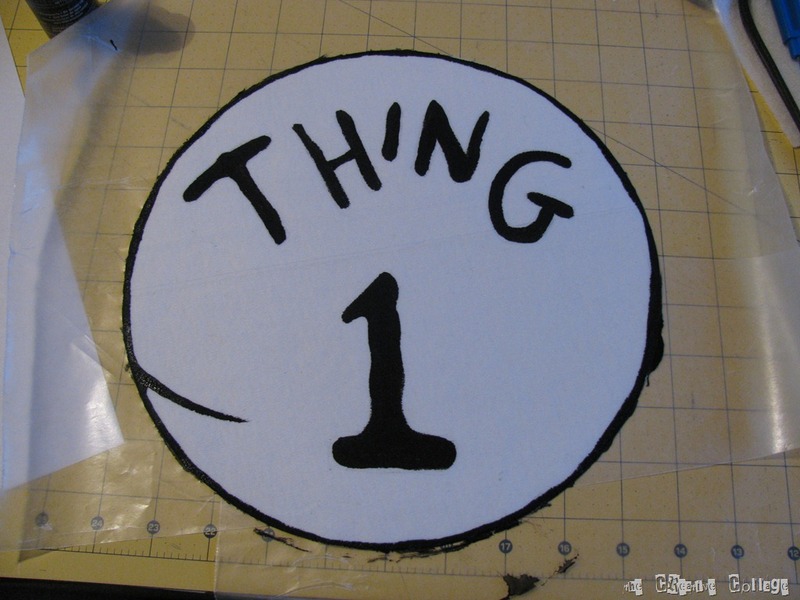 I then mixed black craft paint with a fabric medium and filled in the letters and number. I also added a border. After letting it dry I ironed it to heat set it and stitched it to the front of the shirt. He was really excited to wear it to school this morning!